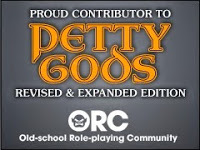 This week's Frugal GM Review is on an "interesting" new DTRPG product uploaded yesterday. 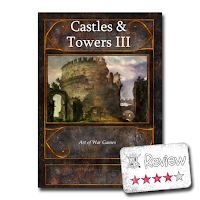 Castles & Towers III is basically a list product that retails for 50¢. The description and "quick preview" really left nothing to the imagination, so I pretty much knew what I was getting with this purchase. I was a bit intrigued that the file was close to 5 MB in size, so I was expecting some art in the six page PDF. There really wasn't any art to be had, aside from the cover, so this download is way too big for what you get. A little poking around tells me that the text on the five pages of content is displayed as a picture, not text. This means you can't search the document, or copy & paste text out of it. Ugh.....definitely loses a star for this unforgivable sin when it comes to a text-rich document. The PDF is locked down with a password and there are no bookmarks. For only a 6 page PDF this really isn't anything I'd care about. For your 50¢ you get exactly what the product description says: "100 different realistic short descriptions of fantasy Castles, Towers, and Holdfasts you might run into. Includes Fort's Name, Description and Commander." no muss, no fuss. No obviously it would be great to have some maps or sketches, or really any art in this product, but my hopes or expectations really only stem from seeing the file size. Since this was just me reading into things, it isn't factored. For a lot of GM's this product would probably just be a waste of 4 bits, but probably because they would want more from what was offered. This is the reason I usually stay away from these list-type products. Now I'm thinking this would be a great product if you already had a larger map and just wanted to populate it with known places that you could later go and back-fill as needed. This is how I plan on using it: I have my region map already. Using Castles & Towers III I'll go ahead and pencil-in place names (from the PDF) into spots that roughly fit the descriptions given. I'll go ahead and map out (or find suitable maps online) the closest couple of locations and work in appropriate hooks that mesh with the descriptions. If my players see the larger map they'll probably think I have the whole region already figured out (I won't) and if they are headed off to one of the other locations, then I work them up.